Home Tags Posts tagged with "Quentin Tarantino"
Like many people in the post-cinema age, I suspect, I first encountered them in the closing sequence of Quentin Tarantino‘s Death Proof: Leader Ladies – or Shirley Cards, or in the off-puttingly Orientalist language by which they’re more traditionally known, China Girls. “Well, I ain’t talkin’ philosophies, I’m talkin’ cars,” says the local sheriff in Dirty Mary, Crazy Larry, a 1974 chase movie that was all-but-forgotten until predictable super-fan Quentin Tarantino started peppering his films with references to it. The sheriff is referring to his own department’s need for vehicles, but out of context it could stand in as the film’s tagline. At the end of 2015, The Hateful 8 barnstormed across select theaters, a whirlwind, even prior to its release, of debate. Positions were staked well in advance, and much of it came down to rather esoteric arguments about 70 mm projection and the future of film. Here are Greatest Movie Characters entries 11-20. First part is here. This is not a ranked list, and the ones below are entered in alphabetical order. 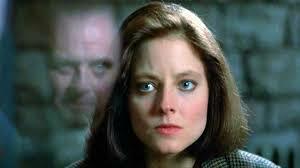 Anthony Hopkins might get the acclaim for his delightfully twisted turn as Hannibal Lector in Jonathan Demme’s Silence of the Lambs, but it’s Jodie Foster’s Clarice Starling that makes it work.